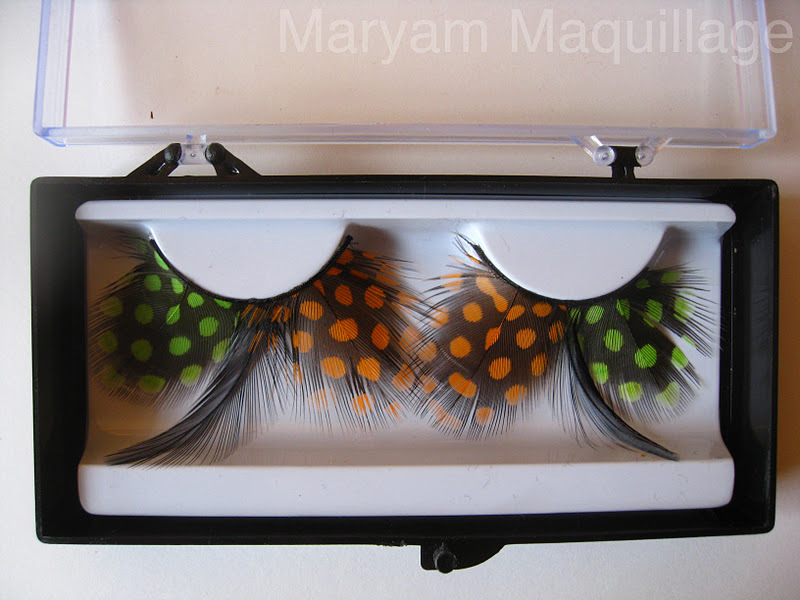 For this look, I used none other than KKcenterHK lashes number FE202 described as a pair of Green and Orange Plumes Pattern Round Feather Lashes (a mouthful indeed :) Here they are, packaged in a clear hard case (great for storage). Includes: lashes, tray, hard case / box. Does not include lash adhesive. Description: Dramatic, bright, bold feather false lashes to be used professionally or by any makeup enthusiast. 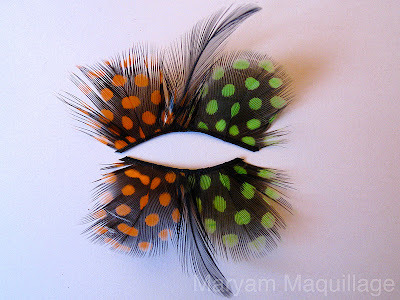 These lashes are perfect for a dress-up party, carnival makeup, or Halloween. Quality: As usual, I'm impressed with the quality of KKcenterHK's costume false lashes. The feathers are soft and light, therefore, they do not weigh heavy on the eye. The band of the lashes, although thick, is surprisingly flexible and is extremely easy to handle. The only drawback is that with lashes this delicate, one has to be very careful when removing them from the tray and even more careful when removing them from the eye. These lashes can be re-used if handled with care and caution. As a special treat, KKcenterHK is offering a 10% off coupon exclusively for "Fix Your Face" by Maryam Maquillage readers. This coupon is good for any merchandise: lashes, makeup, nails or hair products. Click on the code to start shopping, but don't forget to enter it at checkout. This coupon ends February 28, 2012, so get your goodies in time for the holidays!!! NOW, On to the MAQUILLAGE!!! Since these lashes are already very feminine and pretty, I wanted to wear them a bit differently. 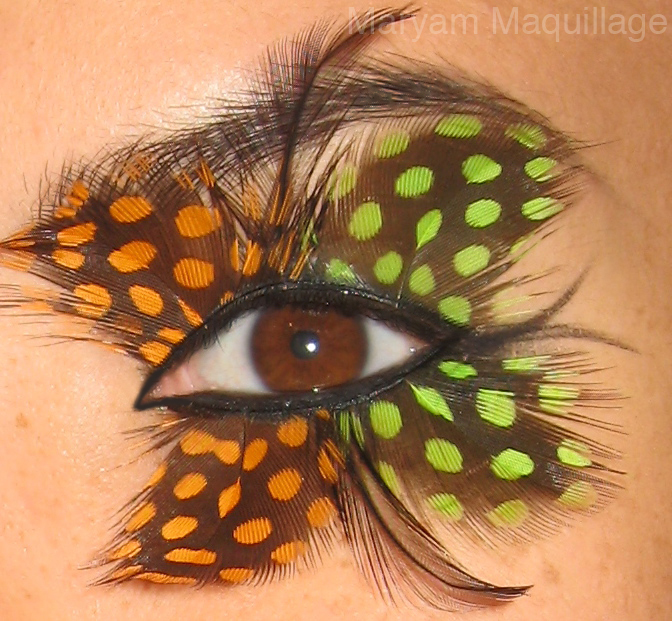 Traditionally, these lashes are to be worn on both eyes, with the feathers curving out, imitating natural lash growth. Instead, I decided the wear the pair on one eye, placed in such a way that the lashes curve inwards, as in the pic above. This way, the feathers look more like butterfly wings. With so much drama on my butterfleye, balance must be made with my other eye :))) On the lips: NYX lip cream in Antwerp. To create this look, simply apply the lashes facing inwards and fill in the gaps between your skin and the lashes with a black liquid or gel liner. Also, line your waterline with a waterproof black liner. Apply black liquid or gel liner to your other eye and extend the inner and outer wings. Line the waterline of your other eye with a white liner to make it appear slightly bigger. Wrap yourself with a neon boa and you're ready for the "Carnaval"... Save this look for Rio, baby!!! UM UM UM UM UM UM UM UM. I just love this so much I'm friggin speechless. THIS IS SO COOLLLLLL! Love love love! simple, yet stunning! i love this!!!! i wanna try it! This is amazing. I love the winged liner on the second eye. It looks great. You are super creative and talented. This is so sick!!! LOVE IT. Those lashes are awesome!! And I love how you did the liner on your right eye too. WOW!! That looks amazing!!! I LOVE IT!!! ^_^ such a gorgeous women you are!!! OH MY GOD!!! Love your butterfly look! I really like your style!. You are stunning!. this looks great! i love that color on your lips. What is it? those lashes are amazing, you look great!!! Those lashes are so awesome! Those lashes are soooooo amazing! :) I love your lip color. wow, that is such an awesome idea! you look amazing as usual, very very creative! You are simply sizzling !